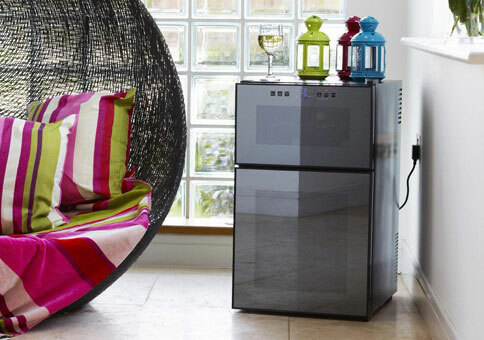 We recommend checking out these top 5 wine coolers perfect for your kitchen. A stylish looking country top fridge designed for just 8 bottles, ideal for the wine loving parents who may have a bottle at the weekend. It is compact and well designed, will look great on the counter top of your kitchen. It has a sleek black case, a stylish darkened glass door and cool blue lights on the top. 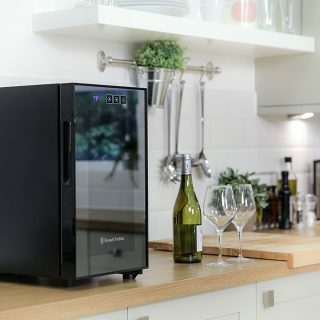 The perfect chiller for any kitchen worktop, check out our Russell Hobbs 8 Bottle Wine Cooler review where we gave it a solid 4 stars. 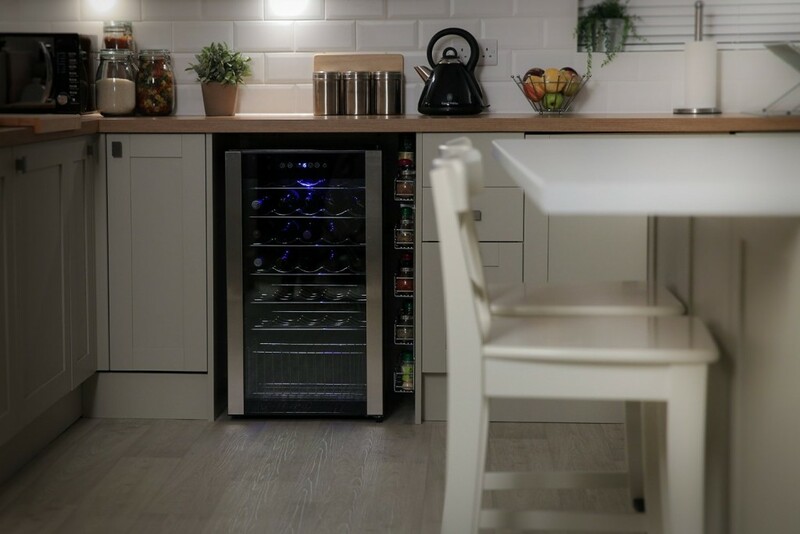 If you are looking for something that can chill more than just your wine then then Husky HUS-HM39 Personal Wine cooler is worth a look. Looking more like a hotel mini bar it has wire racks for wine and then shelves allowing you to store bottle of can drinks and beer. There are 6 internal shelves in total, it has an interior light too, and can be seen through a clear glass door. It has an adjustable thermostat and the door can also be adjusted to open left or right, making it ideal for fitting into any kitchen or space. This fridge also includes a door lock too which is perfect for families that have young children preventing them from getting into this fridge. A smiler design and same stylish sleek design as the number one choice this model is a horizontal version. Still holding 8 bottles and including all the same great features and looks it is 2 rows of 4 bottles. This fridge is great if you want to put it on your kitchen countertop and have wall units too which prevent you from having the vertical model. If you want a large fridge and dual temperature zones then this Russell Hobbs fridge is the one for you. 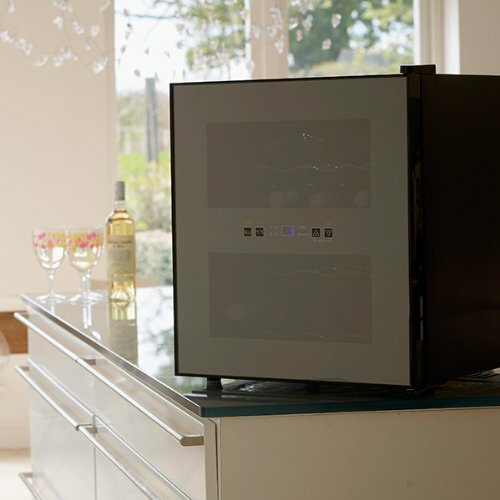 A stylish looking fridge with a black sleek glass door front which allows you to see the wine bottles in the top zone, touch controls in the middle and then a smart dark glass front to the bottom. It has 2 zones allowing you to set different temperatures for the top and bottom. This model has one door which gives access to both the zones top and bottom. 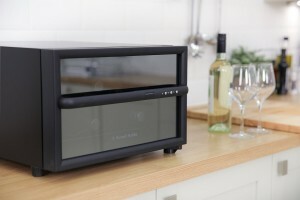 Check out our full Russell Hobbs Two Zone 32 Bottle Wine Cooler review here. Which is the wine fridge for you? How many bottles do you need to store and keep chilled?